Right out of college, young men are paid more than their women peers—which is surprising given that these recent graduates have the same amount of education and a limited amount of time to gain differential experience. While young men (age 21–24) with a college degree are paid an average hourly wage of $20.87 early in their careers, their female counterparts are paid an average hourly wage of just $17.88, or $2.99 less than men. 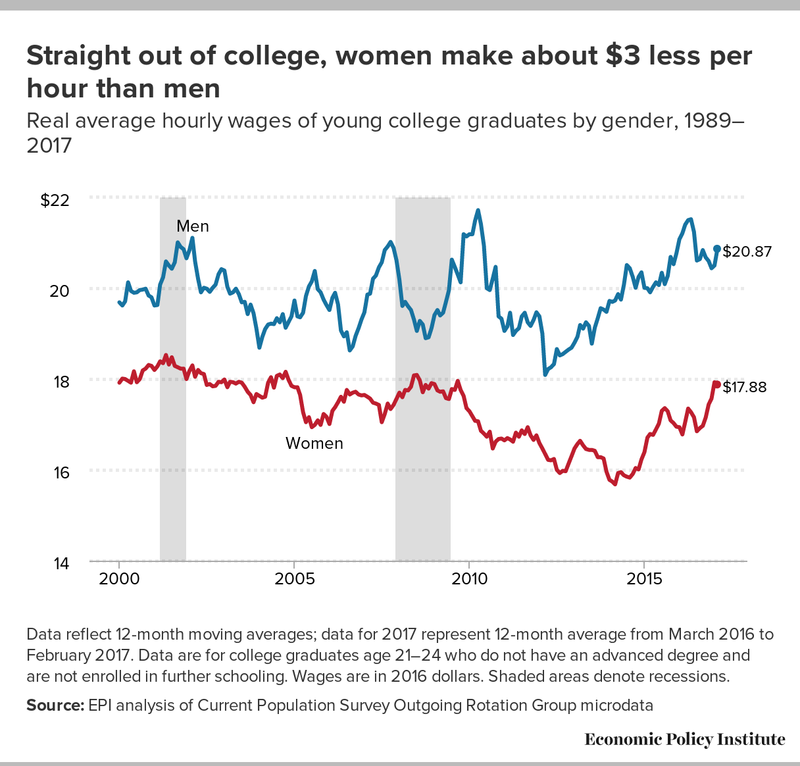 This gap of $2.99 per hour is particularly striking as young women have higher rates of bachelor’s degree attainment (20.4 percent) than young men (14.9 percent). This difference would translate to an annual wage gap of more than $6,000 for full-time workers. While the gender wage gap for young college graduates has closed moderately over the last year, the gap has widened since 2000. In 2000, young female college graduates earned 92 cents for every dollar their male counterparts made. Yet as of February 2017, they earn just 86 cents on the male dollar. Data reflect 12-month moving averages; data for 2017 represent 12-month average from March 2016 to February 2017. Data are for college graduates age 21–24 who do not have an advanced degree and are not enrolled in further schooling. Wages are in 2016 dollars. Shaded areas denote recessions. The best way to close the gender wage gap for people of all educational backgrounds, regardless of gender, is for all working people to see real wage increases, with women’s wages increasing at a faster rate than men’s. The good news is that many of the policies that will raise wages for most working people will disproportionately benefit women, including raising the minimum wage, eliminating the tipped minimum wage, preventing wage theft, and strengthening workers’ collective bargaining rights. At the end of the day, all workers are sorely in need of a raise. See what you could be making in a more equal economy. Data for 2017 are 12-month averages from March 2016–February 2017.